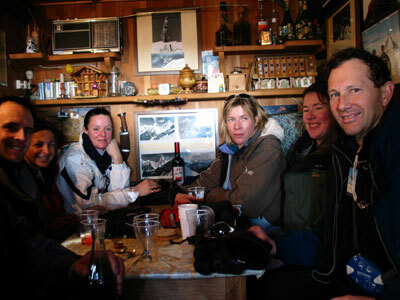 At the end of January 2004 I was lucky enough to find myself heading off to Alagna Valsesia for what was to be one of my most memorable and rewarding trips in a long time. Having become a mum for the first time, 8 months earlier, this would be my first real trip without the wee one and a much needed break. At first it was hard to relax but by the time we had done our first run I realised that this was going to be no ordinary trip and that I wouldn't have time to think about it. Our guide was not only a member of the Italian speed skiing team but he was also determined to make sure we knew it on the first run down. Unfortunately this nearly finished off some of the group who were perhaps not as fit as they would have liked!! Still there was no time to hang about on this short trip, so we headed straight up to the top in what must be one of the oldest cable cars I've ever been in. 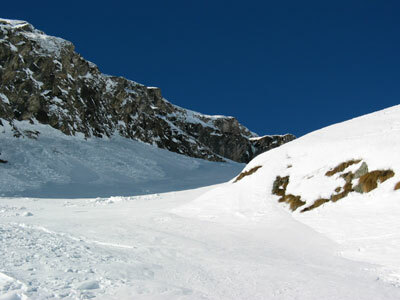 From there only off-piste terrain is accessable. We skied down into Gressoney through a hidden valley called the Eagle Gulley - it was chalky and heavenly to ski. The rest of the morning was spent exploring the off-piste in Gressoney and even though we skied everything but powder and my legs were aching I just couldn't take the smile off my face! Lunch was at one of the refuges where the loos were actually frozen but it felt great to be in a ski area that hadn't been taken over by self-service restaurants and remained unspoilt. The last run of the day was a ski-safari down through the forest and it was nearly dark by the time we reached our hotel..
Day 2 was much of the same - high speed crud, crust and chalk. We had lunch by one of the guides' summer houses and were invited to share some home-made Genepe in his brother's house. It was another world sitting there in his tiny house surrounded by pictures of the him and his brother in the Himalayas. These were real mountain men! Our final day was 'heli-drop' day. Conditions weren't ideal as it was windy so we were restricted from accessing some of the more challanging terrain. 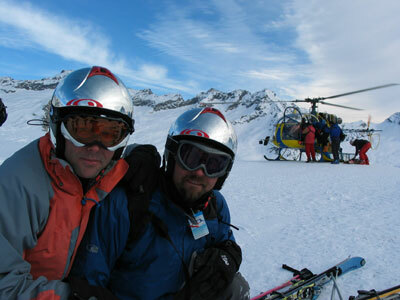 We still had fun but next time we'd like to try the descent from the Monte Rosa down into Zermatt. 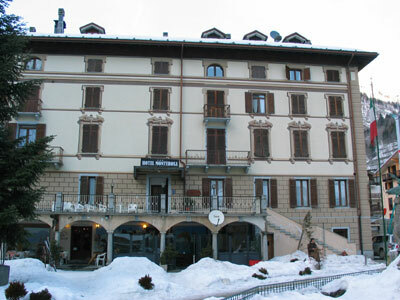 We stayed in one of the only hotels in Alagna - the Monte Rosa which is fairly basic except for the ornate dining room. It's fine for a few nights so long as you don't mind the church bells ringing all-night long ( not great for a new mother!) 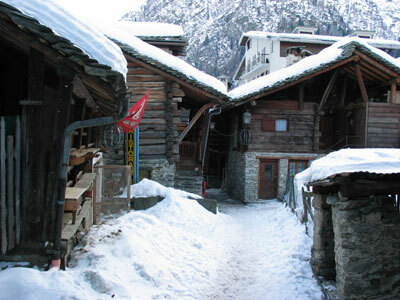 Choice of accommodation is a problem in Alagna as there are restrictions on new buildings being built. 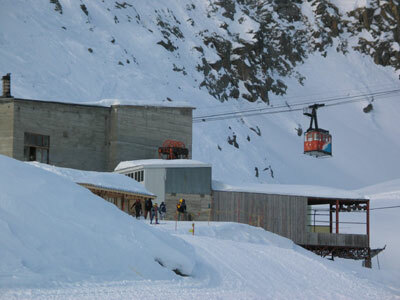 Alagna is a lovely, picturesque village, sedate and quiet with a few bars and restuarants. The locals were friendly and the wine delicious. It's probably somewhere to go before it gets too popular and a guide is definitely recommended.